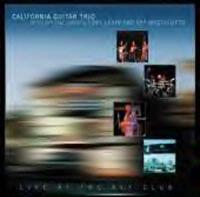 On February 3, 2001, the California Guitar Trio played in Hollywood's Key Club. Fortunately, they also had the stellar rhythm section of Tony Levin and Pat Mastelotto to accompany them. The result is a wonderful effort in exploring the possibilities of a guitar ensemble in both composition and execution. The album is also an exploration of music in general - a CGT concert can run the gamut from Queen to Beethoven to surf music to country, and the band recognizes the power of the music above all else. As talented as the Trio is, it's even more admirable that they are willing to take a back seat to the music itself. The personnel on this album are: Paul Richards, Hideyo Moriya, and Bert Lams, acoustic guitars; Tony Levin, bass; and Pat Mastelotto, drums and percussion. Here the slide is used to strong effect while Lams and Moriya stay in the back with a nimble rhythmic pattern. The use of the slide conjures up images of desolate landscapes. Then, in the middle of the song, the band goes into a hoe-down two-step. The composition finishes off with a country bluesy feel. Only the California Guitar Trio could put a traditional Japanese tune to a surf rhythm, mix in a quote from "21st Century Schizoid Man" and have any of it make sense. Moriya's arrangement of this is outstanding. The guitars and bass all race together in the melody, then the piece pulls back a bit. 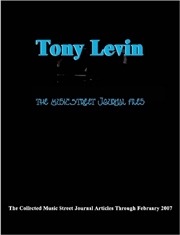 Levin soars over the arpeggiated rhythms of the guitars. This pattern repeats itself, and goes into parts where there is no room for error. This Richards' composition is a bit of a complicated workout, obviously showing that he is quite familiar with, and at home with, Crimsonian composition. The opening of this song features the use of an e-bow for note sustenance. The first part of this number is enhanced by Levin's bass, and Mastelotto adds sparse percussion through a drum machine. The composition then goes into a section where Mastelotto adds contrapuntal drumming and Levin doubles the melody. It ends in a dramatic, powerful fashion. The old classic instrumental, originally placed on the charts by Danish guitarist Jorgen Ingmann, is served up here, showing that the Trio leave no stone unturned in their search for songs to put in their repertoire. The tune is given a straight-ahead treatment, but it's the Trio's "why not?" attitude that makes the piece so much fun. This is billed as an improvisation, but I've never heard an improvisation so organized. For a while, anyway - the piece then devolves into periods of chaos then pulls out into something more manageable. One of the interesting parts of this is that all five musicians know when to build the tension and when to drop out and let the tension release. The King Crimson classic is performed here. This is one of the all-time challenging songs in terms of its rhythmic complexity, but it's nothing that the Trio can't handle, assisted ably by Levin and Mastelotto. The rapid-fire surf classic, revitalized in the film "Pulp Fiction," is done up here. Again, nothing outstanding or too unusual in the arrangement, but the fact that the band does this shows their appreciation for good music, no matter where the source. Richards goes into a spoken history of the trio from its origins with studying with Robert Fripp and the trio's first gig. This bit is actually an intro to the next song. An original by Hideyo Moriya, this song has a strong eastern flavor to it and is a whirling dervish of a piece at times. Written by John McLaughlin, the first part is an off-kilter 7/8 pattern. The lead guitar then gets rather grungy with the slide. The slide section has a maddening stop-and-start meter to it. The song then goes into some amazing picking patterns a la Robert Fripp, and Mastelotto keeps the tension through this section. Then back into the bluesy section, and the number ends as it starts with the 7/8 pattern. Another improvisation, this piece has a feeling of space to it in the interplay of the guitars, the lilting melody, and the restrained percussion. It then becomes almost funky, and the guitars build a dissonance before breaking, and re-establishing that dissonance. A slightly abbreviated version of the Yes classic from the "Fragile" album. Perhaps most interesting is to see how Mastelotto handles the drums on a song that had Bill Bruford's signature all over it. The guitars handle the intricate guitar-bass interplay of the opening movement with ease. The closing verse, with its arpeggiated rhythm pattern, is cut short, and that's a minor gripe - this verse could have used the full treatment to really develop the ending. The trio explore the Ellington-Mills-Tizal classic. There is a section where they go into some fancy country-style picking while the rhythm is on the upbeats. The group then gets exploratory. Mastelotto gets a drum solo, playing with the electronic drums a bit. The trio then simply plays muted chords before going back into the melody. A Richards composition, this is a piece of rare beauty that evokes a wide range of emotions. This song ends the CD (and also ended their show at Martyrs' in Chicago), and it's a song that best incorporates the union of composition and musicianship. And, like "Heart of the Sunrise," it ends all too soon.